View cart “eulogy verses for brother for church, funeral home/parlour crematorium or graveside” has been added to your cart. This pack contains 12 eulogies, 9 eulogy verses and 4 free bonues. The eulogies and verses will help you to express your grief at the loss of a beloved grandmother. 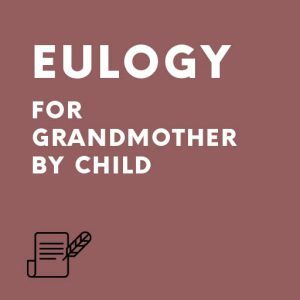 There are eulogies for a grandmother who has died naturally and also specific eulogies if she has died a sudden/unexpected death or died after a long illness. The eulogies speak of what she meant in the family and to others too. They reflect on times past and end with the hope that she will always be with you in spirit. The short, sincere funeral verses summarize your thoughts on the sad occasion. Any one of these verses may be used individually or as a poignant and special ending to your choice of eulogy. Simply say at the end of the eulogy that you feel that your grandmother should be remembered in verse and then say the verse quietly and sincerely. The sympathy acknowledgement verses give a choice of appropriate “Thank you’s” to those who have supported you and shared your grief. The In Memoriam verses provide you with a choice of verses for the cards that are a lifelong reminder of someone who was special in your life. The adult grandson or adult grandaughter of the deceased. What words do you use in a eulogy for grandmother? Let us help you find the ones that tell those present what a marvelous person she was. Our eulogies will help you to express your grief at the loss of a family matriarch. We include in our pack eulogies for a grandmother who has died naturally and also other specific eulogies if she has died a sudden/unexpected death or appropriate ones if she has died after a long illness. The eulogies speak of what she meant in the family and to others too. They say how much she will be missed for her kindness and understanding. They reflect on times past and end with the hope that she will always be with you in spirit. The short, sincere funeral verses summarize your thoughts on the sad occasion. Any one of the eulogies can, of course, be used on its own. You may, however, prefer to use the pieces you like best. Simply say at the end of the eulogy that you feel that your grandmother should be remembered in verse and then say the verse that will summarize your feelings on the day. The eulogy for grandmother pack also includes 10 “Thank you” acknowledgement verses to those who have travelled your sad journey with you. The 10 “In Memoriam” verses provide you with a choice of verses for the cards that are a lifelong reminder of someone who will be remembered as being special in the life of a family.